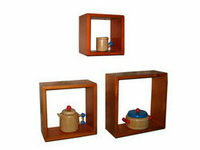 Square cube shelves demenstrate here are simple in design, they are made of solid pine wood or MDF with paint finishes. Mental hooks on the back of shelves enable you hang them to wall and remove conveniently. 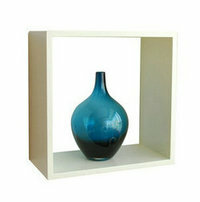 For a single cube shelf, you can place thing on top or inside of it, thus a single cube shelf equals two normal wall shelves. Colors include white, black, honey oak, red, chocolate. Unlike round corner cube shelvings, these square cube shelvings are small in size, they are just suitable to hang to wall instead of place on floor.